A crown or a veneer on a front root canal tooth? Hello Doctor Hall. About 2 years ago I had a root canal on a front tooth. I had a general dentist do the root canal. It wasn’t painful and I was very happy. He wanted to put a veneer on the tooth for a very low price. But, I decided not to do the restoration at that time. I didn’t realize that lack of blood flow to the tooth would make it change color and about a year ago it started to change. I eventually had a porcelain crown put on by another general dentist. She filed down the tooth to a small fang and it really bothered me at the time. So far, the crown is stable. But I know these things don’t last forever. I just want to know if I was duped by the second dentist who did the crown rather than a veneer? Thank you for your time. I have a couple of points in response to your question. First, about the choice of a crown versus a veneer. The simple answer that is taught in dental school to the question, “How do we restore a tooth after a root canal treatment?” is, “Do a crown.” Dental schools really don’t get into doing veneers much. So I wouldn’t say that the second dentist “duped” you—she just did what she was probably taught. But yes, it can be unsettling to have your front tooth ground down to a stub in preparation for a crown. Here’s the explanation for that. Most teeth, when they need a root canal treatment, have an extensive amount of tooth structure missing and they really need a crown. I take it, from your initial decision to not do a restoration, that your tooth did not have extensive decay or a large break. Maybe it was just bumped in an accident. Also, after a root canal, a tooth tends to become more brittle and subject to fracture. A crown helps protect against fracture of the tooth. But there is a difference here in the needs between a front tooth and a back tooth. Back teeth have chewing surfaces and cusps, and when you bite down, the pressure on the cusps tends to push them apart. Thus, when a back tooth breaks, it will likely split between the cusps. A crown will prevent that type of break. Front teeth are subject to different stresses. There is no chewing surface, and the stress on a front tooth is almost all lateral. When you bite together, the lower front teeth push forward on the uppers, and the upper front teeth push backward on the lowers. Also, if you get hit in the face, the impact on the upper front teeth will be a lateral impact. Thus the most likely break of a front root canal tooth is snapping off at the gumline. A crown preparation, which will involve taking off about a millimeter of tooth structure all the way around, will actually weaken a tooth against this type of stress. Here is a photograph of a crown preparation for a front tooth. This is a very conservative preparation. Most dentists will be more aggressive than this in removing tooth structure. 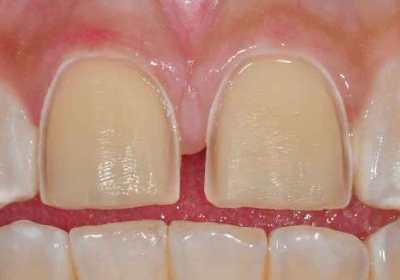 But even with this conservative preparation, you can see that the natural tooth is going to be much stronger in resisting breaking off because of the thicker neck of the tooth. A veneer would leave the tooth much stronger. To prepare a tooth for a porcelain veneer, a dentist has to only remove about half a millimeter of enamel, and from the front of the tooth only. 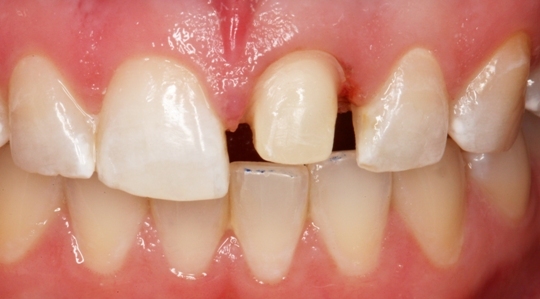 Below is a photograph of two front teeth prepared for porcelain veneers. So why don’t most general dentists do veneers on front root canal teeth? With a much thinner layer of porcelain, it requires more skill on the part of both the dentist and the laboratory technician to block out the darker color of the underlying tooth. Most general dentists really don’t know how to do that. Moving on from that point, I also wanted to make a comment about the discoloration of the tooth. It isn’t widely known that the source of the vast majority of the discoloration of a front root canal tooth is not the tooth drying out, but it comes from the root canal filling materials that are used inside the tooth. When I did a root canal treatment on a front tooth, I would clean out all the root canal filling materials from the inside of the crown of the tooth, place a white fiberglass post down into the root to strengthen the tooth, and then seal the opening I had made into the tooth using composite filling material. With that type of treatment, it could be five or ten years before any discoloration would set in and the tooth would need a veneer.